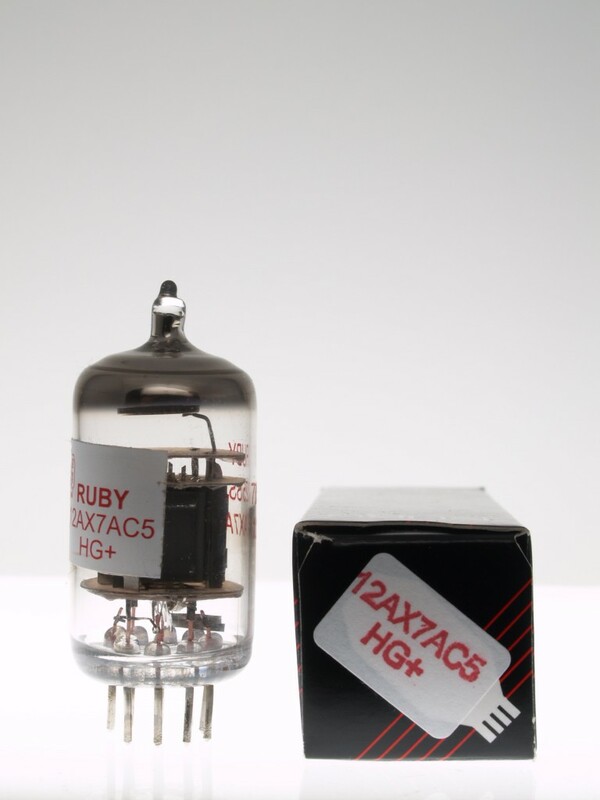 The Ruby 12AX7AC5 High Grade tube is the Shuguang 12AX7 9th gen tube, but distributed by Magic Parts. These are a very consistently made tube, sweet sounding, and very warm. "High grade +" is one of the labels in the measuring system used by Magic Parts. It basically means the tube is best suited for the most sensitive first gain V1 spots. I saw under the reviews for the Ruby 12AX7AC5 HG+ that you recommended those in a Gallien Krueger Fusion 550 bass amp so I went with three of those. They blew me away..fat, punchy, smooth, wide bandwidth...I ended up pulling my compressor out of the chain. They made the JJ ECC83s sound dull and boring. I look forward to recommending your tubes. I finally got around to placing an order for these – actually just the PREs – I wanted to try just those first to see what affect they had by themselves. All I can say is, “Wow,” what a difference they made! My 2203x absolutely nails older Def Leppard (Pyromania), vintage Judas Priest, ACDC, etc. I didn’t think just new PREs would have this much of an affect, but they did. Once again, thanks a ton for the great advice. It’s one of the many reasons why I do business with you and will continue to do business with you. You and your company are top notch. I dropped one of these in v1 of my dsl-50 and it did make a positive difference. I had a standard ruby 2ax7ac5 and didn't think it would make much difference,but it sure did. I got a Ruby 12AX7AC5 HG+ for the V1 slot of my Bogner Shiva. I just want to tell you that it made the OD channel come alive. The amp sounded great already with the standard Chinese 12AX7 I had in there, but when I put this Ruby in I was shocked at how much more touch-sensitive and rich the tone was. The notes just bloom and decay gorgeously with even moderate attack and it is just a thrill to play. The amp has become an instrument in its own right and I love playing it. I can't imagine not having a Ruby HG+ in there now. I had to take the time to give you a shout out, share my story, and to say thanks! I received the tubes on the following Monday as you promised, and I really appreciate it. This time around I needed to get my Victoria 5112 healthy again. Thing just started crapping out on me and making seriously obnoxious noises (outside of my typical guitar playing J). Only three tubes, but I did not have time to sort them out – so I just replaced all three tubes with those I purchased from you. Here’s the thing: the amp has really come to life. I just thought my setup was hosed, but holy cow, what a difference after replacing the tubes. There is a 3 dimensionality and added clarity to it now that just makes my mouth water. Absolutely wonderful. This is the third amp I’ve re-tubed after purchasing tubes from you and I’ve had similarly excellent results with my Boogie F-50 and Rectoverb 50. I suspect I better start really learning about tubes and their impact on tone. So many people argue that they don’t make a big difference, but after hearing these amps I just don’t know how people can argue otherwise. It really makes a difference.